4K resolution is nothing innovative. So far we could come together with it in a digital cinemas. Filming industry have already been using this, and also higher resolutions (6K, 8K) for many years. However the process of a film making consisted of film frame scan into digital form. This process is very cost demanding and only large film studios can afford it. The best examples are movies Baraka (1992) and Samsara (2011), which were scanned into 8K resolution. These methods are still cost demanding film procedures. Fast development of a digital technology haven’t let us waited for too long, and technology nowaday’s allow us to record 4K video directly in digital form, without need of a film frame scan. Also 4K is not only mater of a digital cinemas, but also accesible for home users thanks to 4K UHD televisions and screens. 4K resolution is defined as a horizontal resolution around 4000 pixels. That’s a change towards past television standards, which were always defined in the vertical resolution (480p,780p,1080p). That is because 4K was created for a digital cinemas as a constant horizontal dimension and a vertical dimension changes based on a film aspect ratio. The resolution for a digital cinemas is 4K standarded as 4096 x 2106 px with 8.85 megapixels, which is double of 2K (2048 x1080). 4K 16:9 is a resolution, which follows the horizontal standard 4096 px and a vertical resolution is adaptable for 16:9 aspect ratio, that’s way there is a vertical resolution of 2304 px. That means it’s a resolution of 4096 x 2304 px equivalent to digital cinemas standards, but is also adjustable for viewing on 16:9 televisions or screens without any black horizontal borders on the sides of the screen. That’s because most of home user’s screens and televisions adherence 16:9 aspect ratio (HD, Full HD, UHD...). This format became popular for those film producers, which wanted their films to be played in digital cinemas and at the same time allow the viewing for 16:9 televisions or screens. We also like to use the same format for time-lapse production. These two formats are set for a professional production and for a digital cinemas. UHD (Ultra High Definition) is derived from 4K resolution and is mostly used by manufacters of the televisions, screens, and any other home equipment. It’s a digital television format 3840 x 2160 px, which is in accordance with a basic widescreen 16:9 aspect ration assigned for home users. 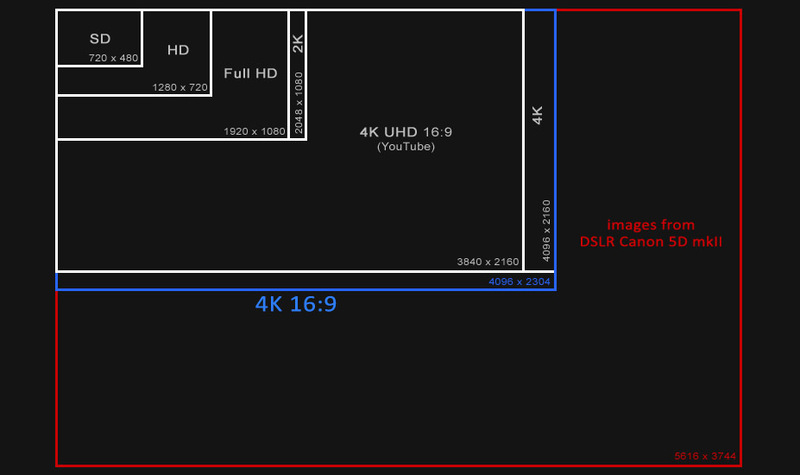 These dimensions are equal to a double of Full HD (1920 x 1080). There are 4K televisions and screens on market, mostly in UHD resolution. This resolution is also in line with YouTube. This format is to view 4K media on home UHD televisions and screens. Time-lapse technique allow us to use resolution of an original size of a photography, in our case up to 5,6K (5616 px horizontally)! Because the difference is significant. There‘s 4 times bigger image area than in Full HD format (eventually 2K). Films in 4K resolution are primarly designated for a digital cinemas and a 4K UHD televisions / screens / projectors. If you posses such a player, then media in a smaller resolution don’t make any sense for you. You can now watch the movies and videos in a resolution, we were only used to see in cinemas until recently. However you can certainly view them also on the common screens of your televisions / computers / laptops or on the projectors with allowance at least of HD / Full HD / 2K resolution. You can as well see the major difference on common screens, especially regarding the sharpness of a details. 4K video is coded differently in the file compare to, for an example, Full HD video. It’s got larger capacity - it’s less compressed and it has got higher bit rate. Huge advantage for streamed videos on web is the allowance of 4K UHD format on YouTube. 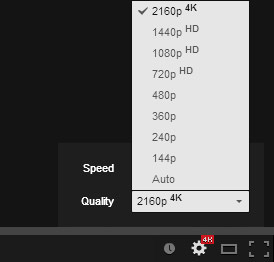 YouTube as a service allow us to view the video in a 4K UHD (3840 x 2160) resolution. On YouTube you can also see the difference in image quality, even on the classic Full HD / HD screen. That’s because YouTube the process of uploading a videos works differently, in accordance of their’s resolution. It means, that the highest allowed resolution (2160p) will be subject to the lowest compression, it’s going to keep the highest bit rate and video data will sustain the lowest loss on data size, compare to the other resolutions. These changes of compression and quality of the video are visible also if we watch them in a lower resolution. In practice it meants, that if we have uploaded one 4K video on YouTube, second video in Full HD resolution and after we’ll watch them both in 1080p resolution, the image quality of 4K video will be better and sharper than the image of a Full HD video. Consequently, if you have any screen, you are always going to see the difference between 4K video and the video in a lower resolution on YouTube. These are the printscreens from the viewing of both videos in Full HD resolution and on Full HD screen. And this is their’s detail zoom on 200%. However, certainly to view the videos in better resolution on YouTube you will need a high speed internet connection. 4K resolution is always the best choice, when you have any resolution on your screen.